Once upon a time, Taihape Scenic Reserve must have been an impressive and immaculately managed place, with well manicured paths, neat signboards, and perhaps a regular gardener called Bert or Bill who would come and tend everything and doff his cap to the passing visitors. Now though, there’s no sign of Bert or Bill, and the place is neglected and overgrown. But despite that – perhaps even because of it – it has a different sort of magic, and the dogs enjoy it just as it is. Given its neglect, it’s not surprising that there are no sign posts to the Taihape Scenic Reserve, and little information either at the i-site on the busy main street or on the web. We can find it, however, by going to the bottom of Tui Street, then walking around the edge of the memorial park (past the swimming centre) – making sure, as we’re asked by the somewhat forbidding poster at the entrance NOT TO LET OUR DOGS ON THE PLAYING SURFACE. If we then follow the fenceline behind the belt of tall white pine trees, we find a small gateway, which leads into the reserve. After 200 metres or so, the path stops descending, and bears right. At a few places, if we’re willing to scramble, we could probably get down to the river. But if we stay of the path, it leads in a broad semi-circle, along the edge of the gorge to another fenceline, with another gate, on the far side of the reserve, then up the slope to the stockyards. 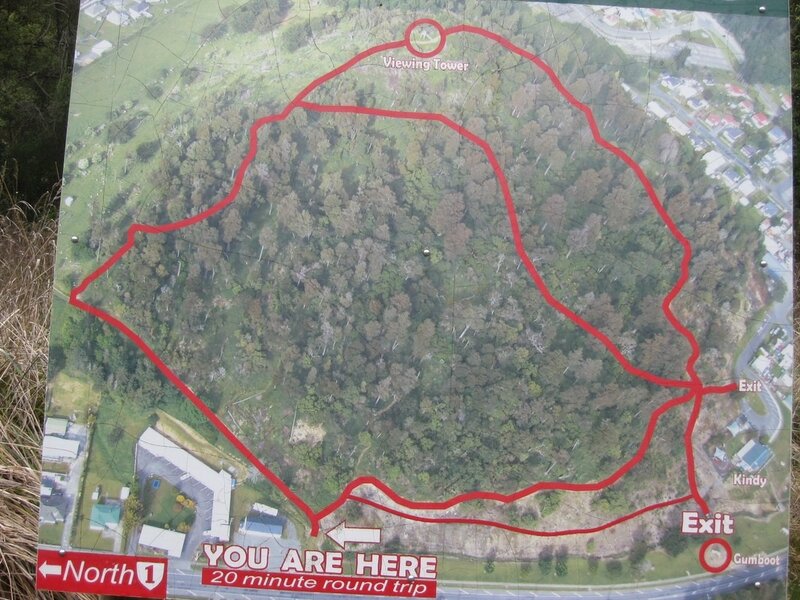 From here, to complete the circuit, we have to be a bit adventurous, for there’s no clear path back to the entrance gate. Instead, though, we can choose from a score of small, interwoven tracks that have been trampled through the undergrowth, and as long as we head generally in a diagonally upslope, we’ll soon find our way back to the gate. The whole walk is probably about 1.5 km – not far. But it’s a welcome chance to stretch our legs and walk the dogs after (or before) tackling the barren and dogless drive across the Desert Road. And yes, it may be a bit untidy and sad, but I like its sense of peace and faded glory.